The video Why is the International Space Station 400 km above the Earth? first mentions that there are fairly hard limits at 300 km (due to imminence of reentry) and 700 km (loss of protection from radiation associated with the lower Van Allen radiation belt), and so a value of 400 km, close to the lower limit was chosen based on cost; Space Shuttle launches being expensive. I'm guessing that the cost argument was based on the need for additional Shuttle launches because they were often maxed out on weight, rather than the cost of extra LOX. Question: Now that the ISS is built, and unmanned rockets bring the majority of resupply weight to it, are these generally or at least frequently still maxed out on payload weight so that a significant increase in ISS altitude would require significantly more launches and therefore higher cost? Or would a move from 400 km to say 500 or 600 km not significantly lower the number of launches per year for the same resupply and crew transport? Any other reasons why 400 km would be better than 500 or 600 km? For the purposes of this question assume the ISS was equipped with solar/electric ion propulsion so that the raising maneuver itself didn't incur substantial costs due to hauling of a lot of fuel, and that there was some reason why say 600 km was considered advantages to 400 km. Also, while the cost of transport may be decreasing due to developments such as reusability, ignore that since one source of savings would not make another source of savings obsolete. ISS orbits during shuttle were often kept low to increase the shuttle payload. It had a lot of losses going much above 360km. After the shuttle was retired, the ISS orbit was boosted a bit to 415km+ to further reduce the drag losses. 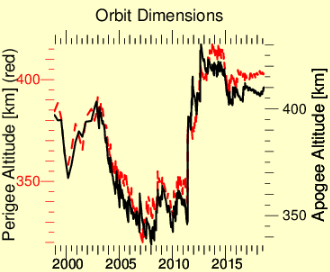 In 2014 the altitude was decreased from 415-420km to below 405km. In 2015 although the altitude was much lower than it had been for the past several years, it was decided that doing a normal phasing burn might take the station "too high" and they actually propusively lowered the orbit to allow it to stay closer to 405km. This maneuver makes zero sense if higher altitudes were preferable. The press release suggests that this was mainly due to debris risk. So at least under times of reduced solar stress, the threat of MMOD appears to be such that they don't want to go much higher. It doesn't appear to have been raised above 410km since 2015.